The glomeruli act as sieve for blood passing through the kidneys. The rate at which filtered blood passes through the kidneys is glomerular filtration rate (GFR). The GFR is the best indicator of renal health. Creatinine, an endogenous end product of creatine phosphate metabolism, is solely excreted through the kidneys, and the volume of plasma that is cleared of this creatinine in a unit time, creatinine clearance (CLcr), estimates the GFR. Creatinine, however, is secreted by the proximal tubules of the kidney, and this makes CLcr to overestimate the GFR. Fortunately, this bias is known to be about 15% of the total estimate. Exogenous markers such as diethylenetriaminepentaacetic acid, ethylenediaminetetraacetic acid, and iothalamate are also used to estimate the GFR. Exogenous markers are expensive and technically difficult to use. These make them difficult to use in clinical settings in developing countries like Nigeria. Creatinine is an endogenous marker that is excreted solely by the kidney, and its clearance is a good estimator of renal health. The GFR is used to stage chronic kidney disease (CKD) as shown in [Table 1]. Management of CKD depends on the stage of the disease. The stage influences the choice and dosage of drugs, restriction of certain food and salts, commencement of dialysis, and decision to do renal transplant. Where, Uc is urine creatinine, Urine vol is 24-h urine volume, Scr is serum creatinine, and 1440 mins is minutes in 24 h.
This requires the collection of 24-h urine. There are technical difficulties in timing, proper collection, and storage of 24-h urine. One also has to wait for 24 h to make diagnosis and take decision. It therefore became necessary to develop models that can be used to estimate GFR without using 24-h urine. 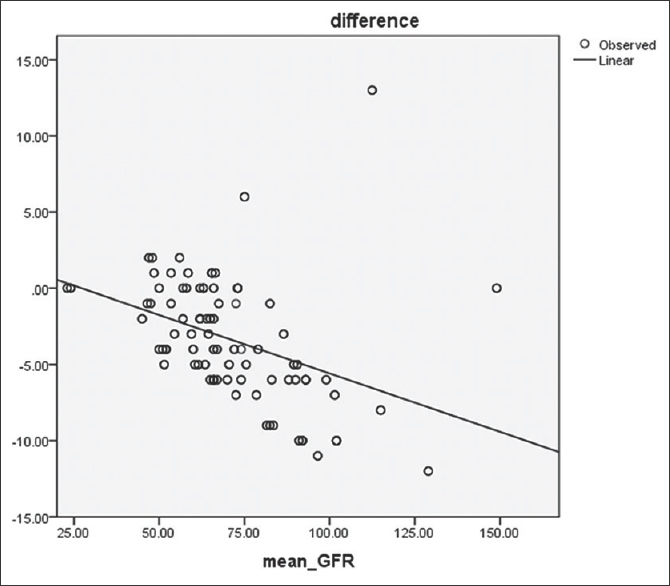 There are many models used to estimate GFR, but two are mainly used in Nigeria. The models depend on age, gender, race, and serum creatinine. They are the Modification of Diet in Renal Disease (MDRD) study equation and Chronic Kidney Disease Epidemiology Collaboration (CKD-EPI) formula. Where, Scr is serum creatinine (mg/dl). k is 0.7 for females and 0.9 for males. α is −0.329 for females and −0.411 for males. min indicates minimum of Scr/k and 1.
max indicates maximum of Scr/k and 1. Despite the availability of these equations that can be used to estimate the GFR and make diagnosis of CKD early, the prevalence of CKD is rising in Nigeria. In 2009, Afolabi et al. found a prevalence of 20.4%. In 2014, Odenigbo et al. got a prevalence of 43.5%. Most (80%) cases that reach nephrologists involve young and middle aged people and are diagnosed as end stage, when treatment becomes difficult. The apparent rise in the prevalence of CKD in Nigeria may be because of the rising prevalence of the predisposing factors: hypertension, diabetes mellitus  cystic kidney disease, and glomerulonephritis. The patients present late to nephrologists. The late presentation may be because the primary care physicians fail to make appropriate diagnosis early enough. The tools to make this diagnosis are the estimated GFR (eGFR) estimating formulas: MDRD and CKD-EPI formulas. If the estimates show significant differences, then there will be significant differences in staging the disease. The primary care physician, depending on the tool he uses, may miss early CKD, and hence, miss early referral. The MDRD, as the name implies, was developed with renal disease patients in mind. It has been found to be imprecise and to underestimate GFR in high values. The developers thus developed a new equation that should be as accurate as MDRD in low GFRs and more precise and less underestimated at GFRs above 60 ml/min/1.7sm 2. Hence, the development of CKD-EPI model. These equations may expectedly disagree and it may be possible that this disagreement makes proper classification of CKD patients, and thus, proper diagnosis and early referral difficult. There have been studies that compared the equations for estimating GFR in Nigeria that found different estimates from different equations ,, but few if any actually tested the significance of the differences in the estimates. These formulae were not modeled with Nigerian variables. The developers of MDRD developed CKD-EPI formula because of inadequacies in the MDRD formula. The population is American, and they put in factors to capture black Americans showing that the accuracy of the model depends on race. If different models give different estimates of same variable and the models are not done with the index population in mind, then the difference in the estimates could be because of the peculiarity of the index population. The peculiarity of Chinese race informed the modification of MDRD study model to suit the Chinese population. Similar reasoning informed the development of a model in Bangladesh for the Bangladesh population. Greece also had to develop their own formula for their population. Eastwood et al. in 2010 stressed the urgent need for an equation tailored specifically to the needs of the lean populations of Africa. The aim of this research is to investigate the significance of the difference in the estimates from the two models used in Nigeria to estimate GFR. The objective is to use the two models to estimate GFR from the same population of patients and test the difference in the estimates for significance for a set of data collected in a private general practice hospital in Nkpor, Anambra State of Nigeria. The diagnosis and staging of CKD and cutting edge decisions on its management require eGFR estimates that will be very close to the real GFR. This research would have been the stimulus Nigerian researchers need to develop a model for Nigerian population with Nigerian variables. This is a cross-sectional study of patients attending a general practice hospital. Obinwanne hospital is a general practice hospital situated at Nkpor, an urban town close to Onitsha in Anambra State of Nigeria. The records of patients attending the hospital that had kidney function tests as part of the investigations in their management were extracted for study. Data on gender, age in years, weight in kg, and serum creatinine in mg/dl were extracted from the patients' folders. The serum creatinine tests were done by Jaffe kinetic method using Randox kit (USA). The kit is calibrated with isotope dilution mass spectrometry-traceable calibrator reportable in mg/dl. The data were analyzed with International Business Machines Corporation Statistical Package for the Social Science (SPSS) version 20, Armonk, NY, United States of America. Where, n = sample size. α = significance level (fixed at 0.01). z = critical value for 99% confidence level corresponding to 0.01 significance level = 2.58 for a 2-tailed test. p = prevalence of CKD is 0.435 from previous study. d = error level which the researchers are willing to tolerate (set at 0.1). Renal failure is end-stage kidney disease, and the researchers want to be 99% confident that the sample size will be large enough to pick any difference in the tests. The error level of 10% is used because the researchers want to be 90% confident that the calculated sample size will not be more than 5% away from the actual value. Eventually, n = 166 was used because the number of case notes with relevant data from July 31, 2016 to June 30, 2017, a period of one calendar year, was 166. This study involved only records. Strict confidentiality was maintained not to disclose the identity of the patients that have the records. The content of the records includes: age, gender, and serum creatinine levels of the patients. The medical director of the hospital from where the data were obtained gave his consent for the study to be done in his facility. where, , is the mean eGFR from MDRD. is the mean eGFR from CKD-EPI. 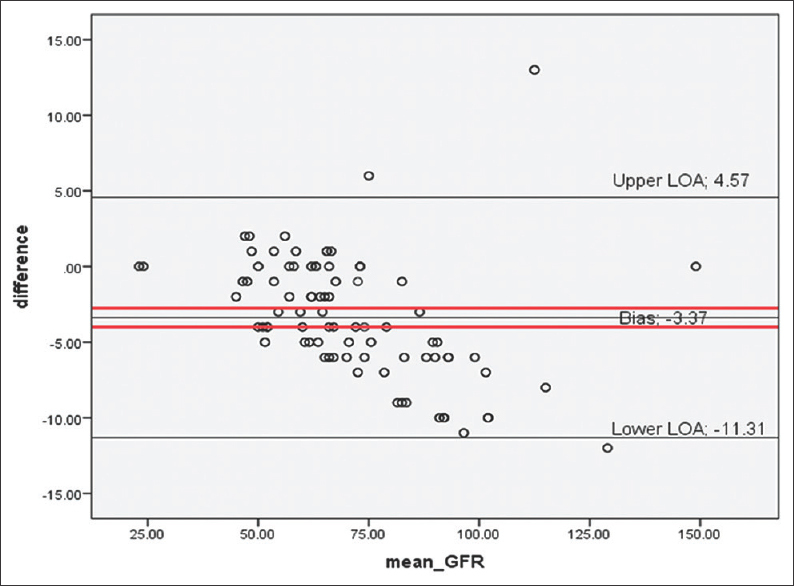 A scatter plot of the eGFRs from MDRD against CKD-EPI is performed to show correlation visually. The Pearson's correlation coefficient is calculated. The mean difference is calculated, and Bland and Altman plot is used to test for agreement of the two formulae and quantify bias by plotting the differences against the mean eGFR. The mean difference is the bias. There may be good correlation but still a consistent tendency for one method to exceed the other in the measurements. In the absence of a reference standard, the mean of the eGFR obtained from the same sample from same patient by the two methods is taken as the reference standard. Mean eGFR = (MDRD + CKD-EPI)/2. Let xi be eGFR from MDRD and xj be eGFR from CKD-EPI. Let the mean of the difference , be the mean difference and is denoted as d¯ and the standard deviation as Sd, then the limit of agreement (LOA) is d¯±1.96Sd, where 1.96 is the standard normal variate for 95% confidence interval. Hence, 95% of the values should lie within the upper and lower LOA. The import of this LOA is subject to its clinical importance. For eGFR, two eGFRs are statistically different if they differ by more than 11 ml/min/1.73m 2. The standard error of the mean difference is estimated, and the 95% confidence interval around it is calculated. If it does not include zero, then the bias is significant. A simple linear regression is used to test for the presence of proportional bias. Precision is assessed using the variability of the data. The assumption is that the differences in the eGFR from the models are normally distributed. This assumption is tested pictorially using histogram. A total of 166 patients were studied, 62 males (37.3%) and 104 females (62.7%). The mean age was 49.06 years with sd 15.26. The youngest was 18 years and the oldest 82 years. The data on eGFR may not have a normal distribution, but the differences are approximately normally distributed (skewness is 0.579), see [Figure 1]. The models show high correlation as shown by fitting a regression line on the scatter plot, see [Figure 2]. The mean and sd of the eGFRs from the two models are as in [Table 2]. The mean eGFR values from the two models significantly differ, P < 0.000. The mean difference, bias, is significant P < 0.000, showing that there is a consistent tendency for MDRD model to underestimate GFR compared with CKD-EPI model using the mean of the two values as reference standard. The MDRD model is more precise because the sd of its mean is smaller. Bland and Altman plot shows clearly a lack of agreement between the two models, with a bias of –3.37, and the confidence interval around the mean difference does not include zero. The upper and lower levels are shown by thick red parallel lines above and below the mean error, see [Figure 3]. Despite their high correlation, the two models consistently differ in their measurements. [Table 3] shows the upper and lower confidence intervals around the mean difference using the standard error of mean. The upper level is −2.75, and the lower level is −3.99. 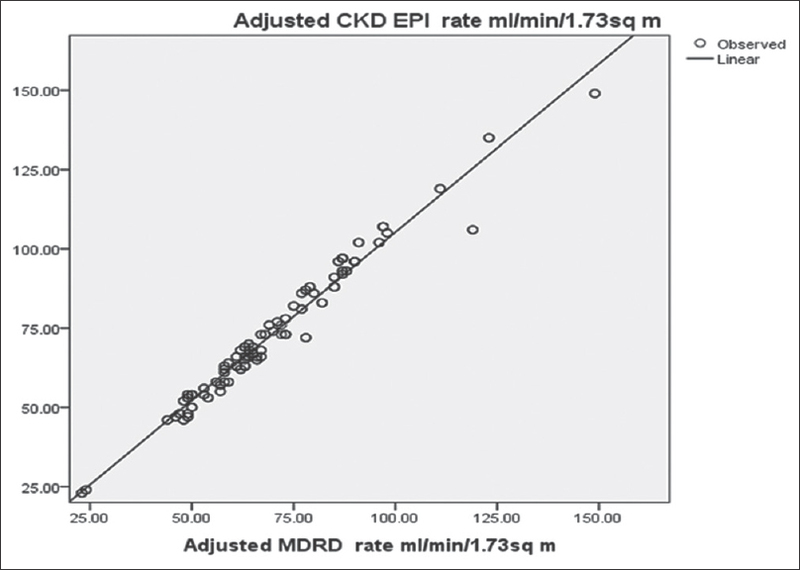 Our result shows a good correlation between MDRD and CKD-EPI models in estimating GFR. This is expected because CKD-EPI model was developed to be an improvement on the earlier MDRD model. Uche and Osegbo also noted this correlation even among sickle cell patients in South West Nigeria. However, correlation does not imply agreement. The mean eGFR obtained from the different models significantly differ on the paired t test. There is a mean difference whose confidence interval does not include zero. 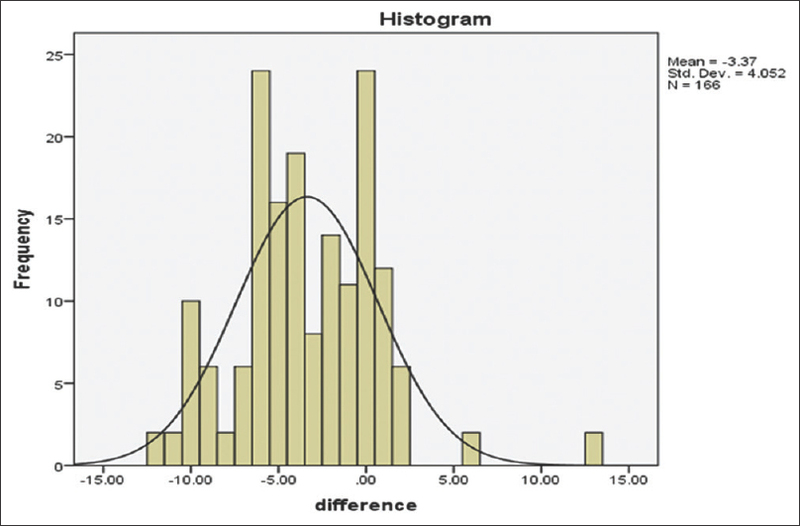 The 95% confidence interval of the mean difference illustrates the magnitude of a systematic difference in the measurements. If the line of equality, zero, is not in the interval, then the systematic difference is significant. This means that one method consistently under or overestimates compared with the other. It is known from previous research works that MDRD underestimates GFR more than CKD-EPI. This bias has been quantified to be between 2 mls/min/1.73 m 2 and 5ml/min/1.73m 2.,, Ours is 3.37. Earlier work did not construct confidence interval around the mean difference to establish whether the bias is by chance or statistically significant. A confidence interval around the mean difference should be constructed and if the line of equality is not within the interval, then there is a significant systematic difference. This research shows the interval as −2.75 to −3.99. It certainly does not include zero. This shows beyond reasonable doubt that MDRD systematically significantly underestimates GFR compared with CKD-EPI model in this study on a Nigerian population. The interval in the level of agreement from the Bland and Altman plot within which 95% of the measurement should fall is 15.88 (from upper Limit of Agreement (LOA) to lower LOA). This is the distance between mean difference ±2 sd (sd is standard deviation of the mean difference). Badrick and Turner had established that for clinical purposes, GFR fluctuation should not exceed 11 mls/min/1.732. The finding in this research is that the confidence interval is too wide and this even compounds the disagreement in the two models studied. Similar studies on Nigerian population could not be seen to compare this study with. The regression of the difference against the mean eGFR also shows that this significant systematic bias is proportional. It increases as mean eGFR increases. The import of this proportional bias is that at higher levels of GFR, values obtained cannot be relied on and one can easily miss or wrongly diagnose early CKD. Good management outcome of CKD depends on its early detection. This tendency of MDRD to underestimate GFR compared with CKD-EPI model suggests that MDRD model will be a good sensitive screening tool. CKD stage 1 is kidney damage with normal GFR (90 and above). This is the stage where management gives the best outcome. Intuitively, a screening tool that underestimates GFR will pick low normal GFR around 90 mls/min as below 90 mls/min. This high sensitivity inadvertently creates opportunity for picking up CKD early. Considering the high morbidity and mortality associated with CKD, it will be better to have a more sensitive screening test than a more specific one. There may be other factors that lead to increase in prevalence of CKD and late presentation to nephrologists but one cannot rule out the possibility that the screening test tool used may contribute if it is not sensitive enough. Fischer et al. noted that late referral of CKD patients to nephrologists may, in part, be because of the perceptions and knowledge limitations of the primary care providers. MDRD significantly underestimates GFR compared to CKD-EPI in a Nigerian population. This bias is proportional and increases as mean eGFR increases. There is urgent need for further studies to develop GFR estimating model on Nigerian variables. MDRD can be used for screening purposes because it underestimates GFR compared to CKD-EPI more at high values of GFR and as such is intuitively more sensitive. We could not establish the reference standard using CLcr in 24-h urine. Hence, the mean of the values from MDRD and CKD-EPI models was used as the reference standard. There was no financial support or sponsorship to the researchers. The research was funded exclusively by the researchers. KDIGO. KDIGO 2012 clinical practice guideline for the evaluation and management of chronic kidney diseases. Kidney International Supplements 2013;3:5-14. Renal function-Wikipedia. Available from: https://en.wikipedia.org/wiki/Renal_function. [Last assessed on 2017 Oct 20]. Levey AS, Bosch JP, Lewis JB, Greene T, Rogers N, Roth D. A more accurate method to estimate glomerular filtration rate from serumcreatinine: A new prediction equation. Modification of Diet in Renal Disease Study Group. Ann Intern Med 1999;130:461-70. Levey AS, Stevens LA, Schmid CH, Zhang YZ, Castro AF, Feldman HF, et al. A new equation to estimate glomerular filtration rate. Ann Intern Med 2009;150:604-12. Afolabi MO, Abioye-Kuteyi EA, Arogundade FA, Bello IS. Prevalence of chronic kidney disease in a Nigerian family practice population. SA FamPract 2009;51:132-7. Odenigbo CU, Oguejiofor OC, Onwubuya EI, Onwukwe CH. The prevalence of chronic kidney disease in apparently healthy retired subjects in Asaba, Nigeria. Ann Med Health Sci Res 2014;4(Suppl 2):S128-32. Bello-Ovosi1 BO, Asuke S, Abdulrahman SO, Ibrahim MS, Ovosi JO, Ogunsina MA, et al. Prevalence and correlates of hypertension and diabetes mellitus in an urban community in North-Western Nigeria. Pan Afr Med J 2018;29:97. Aladeniyi1 I, Adeniyi OV, Fawole O, Adeolu M, Ter Goon D, Ajayi AI, et al. The prevalence and correlates of pre-diabetes and diabetes mellitus among public category workers in Akure, Nigeria. Open Public Health J 2017;10:167-76. Haynes R, Staplin N, Jonathan Emberson J, Herrington WG, Tomson C, Agodoa L, et al. Evaluating the contribution of the cause of kidney disease to prognosis in CKD: Results from the study of heart and renal protection (SHARP). Am J Kidney Dis 2014;64:40-8. Stevens LA, Coresh J, Deysher AE, Feldman HI, Lash JP, Nelson R, et al. Evaluation of the MDRD Study equation in a large diverse population. J Am SocNephrol 2007;18:2749-57. Shittu ST, Jeje SO, Fasanmade AA. Assessment of renal function and predictive performances of GFR estimating equations among Nigerian diabetic patients. Br J MedMed Res 2014;4:4259-71. Aneke JC, Oyekunle AA, Adegoke AO, Sanusi AA, Okocha EA, Akinola NO, et al. The utility of the CKD-EPI formula for determination of glomerular filtration rate in Nigerians with sickle cell disease. Egypt JHaematol 2015;40:185-9. Agaba EI, Wigwe CM, Agaba PA, Tzamaloukas AH. Performance of the Cockcroft-Gault and MDRD equations in adult Nigerians with chronic kidney disease. IntUrolNephrol 2009;41:635-42. Ma YC, Zuo L, Chen JH, Luo Q, Yu XQ, Li Y, et al. Modified glomerular filtration rate estimating equation for Chinese patients with chronic kidney disease. J Am SocNephrol 2006;17:2937-44. Saiedullah M, Rahman MR, Khan AH, Hayat S, Begum S. Comparison of GFR by creatinineclearance with estimated GFR by various prediction equations in a Bangladeshi population. J Life Sci 2012;6:331-5. DiamandopoulosA, Goudas P, ArvanitisA. Comparison of estimated creatinine clearance among five formulae (Cockroft–Gault, Jelliffe, Sanaka, simplified 4-variable MDRD and DAF) and the 24hours-urine-collection creatinine clearance. Hippokratia 2010;14:98-104. Eastwood JB, Kerry SM, Plange-Rhule J, Micah FB, Antwi S, Boa FG, et al. Assessment of GFR by four methods in adults in Ashanti, Ghana: The need for an eGFR equation for lean African populations. Nephrol Dial Transplant 2010;25:2178-87. IBM Corp. Released 2011. IBM SPSS Statistics for Windows, Version 20.0. Armonk, NY:IBM Corp.
Charan J, Biswas T. How to calculate sample size for different study designs in medical research. Indian JPsychol Med 2013;35:121-6. Bland JM, Altman DG. Measuring agreement in method comparison studies. Stat Methods Med Res 1999;8:135-60. Badrick T, Turner P. The uncertainty of the eGFR. Indian J ClinBiochem 2013;28:242-7. Uche CL, Osegbe ID. Comparison of CKD-EPI versus MDRD and Cockcroft-Gault equations to estimate glomerular filtration rate among stable homozygous sickle cell patients in Southwest Nigeria. Niger J ClinPract 2017;20:816-21. Cristelli1 MP, Cofán F, Rico N, Trullà s JC, Manzardo C, Agüero F, et al. Estimation of renal function by CKD-EPI versus MDRD in a cohort of HIV-infected patients: A cross-sectional analysis. BMC Nephrology 2017;18:58.doi: 10.1186/s12882-017-0470-4. Published online 10th February 2017. Bermúdez RM, Sanjuán JB, A. Samper AO, Castán JA, García SG. Assessment of the new CKD-EPI equation for estimating glomerular filtration rate. Nefrologia 2010;30:185-94. Veronese FV, Gomes EC, Chanan J, Carraro MA, Carmargo EC, Soares AA, et al. Performance of CKD-EPI equation to estimate glomerular filtration rate as compared to MDRD equation in South Brazilian individuals in each stage of renal function. ClinChem Lab Med. Published online. 2014. doi: 10.1515/cclm-2014-0052. Fischer MJ, Ahya SN, Gordon EJ. Interventions to reduce late referrals to nephrologists. Am J Nephrol 2011;33:60-9.